Olive oil skin care is a luxurious beauty and skincare treatment that offers natural anti aging benefits. This century-old beauty secret can be used as part of your daily beauty routine. People all over the world today apply this lavish oil directly to moisturize, nourish, and protect their body. The oil is rich in botanical nutrients that are naturally absorbed to help restore, repair, and help retain a youthful appearance. 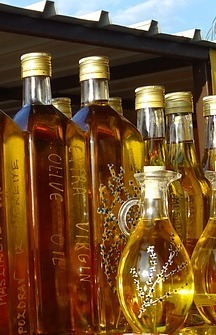 For the maximum benefits use cold-pressed extra virgin olive oil. Many popular products are available that incorporate this key ingredient in their formulas or many people choose to make their own recipes. An excellent emollient that helps to maintain a moisture balance that both soothes and absorbs easily without clogging pores. The rich Vitamin E content has tremendous healing regenerative properties. Helps keep skin stay supple and elastic, helping to minimize stretch marks. *The” squalene” ingredient in it lubricates your skin and helps retain moisture and regulate sebum. The antioxidant-rich oil helps neutralize free radicals, repair damage to cell membranes, and protect from the damaging external elements such as the sun’s ultra-violet rays and the environmental pollutants. Olive oil benefits for skin also include its high amount of polyphenols (Anti-inflammatory, Antioxidant compound) which help to slow the aging process. Great for a fantastic all-over body, rejuvenating massage treatment. Home spa treatment- add one or two tablespoons in your bath water. Wonderful to use for an at-home manicure- Adding a few drops to a warm-water soak will soften cuticles. Heal dry, cracked hands and feet- Apply oil treatment to area and cover with gloves or socks over-nite. Great for hair care as a conditioner, and frizz control. Optional- Add 2-3 drops of Vanilla or Lavender Essential Oil or 2 Tablespoons Lemon juice. A sugar scrub is wonderful for exfoliating roughness on all areas of the body. Combine ingredients together and rub in mixture to cleanse and exfoliate. Rinse off with lukewarm water and pat dry. Optional- Add 1 beaten egg yolk to mixture for tightening effect. Mix ingredients together. Apply to face. Leave on for 20-30 minutes. Rinse off well with warm water. This easy recipe can be personalized to suit. Enjoy all the many olive oil skin care benefits this rich, natural beauty remedy can offer and be sure to save some for cooking.